Matt Bennett presents episode 2 of Matt B Sides. Featuring Daniel Lutheran, Corey Glick , Andrew Lutheran and Billy Marks taking matters into their own hands -- going DIY with a portable handrail in a school yard. Toy Machine's Jordan Taylor and bro Alex Schmidt share a nice lil one-off edit -- shredding the streets. Other cameos include: Filmer Ryan Lee, Ryan Spencer, and Dakota Servold. Blake Carpenter is now PRO for Toy Machine! 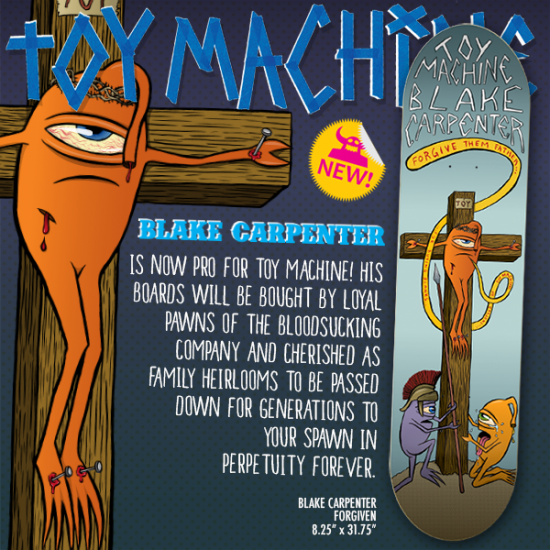 Blake Carpenter is now pro for Toy Machine! And his boards will be bought by loyal pawns of the bloodsucking company and cherished as family heirlooms to be passed down for generations to your spawn inperpetuity forever.